For the first time, Campbell Soup Company — in the midst of a major push to expand its e-commerce business and digital interaction with consumers — is, at least initially, launching a new product exclusively via e-commerce. The products, which have a suggested retail of $4.99 for a six-pack of 8-ounce cans, will this week also begin rolling out to the approximately 24 U.S. markets now served by Peapod, Ahold Delhaize’s grocery e-commerce site. Starting in November, V8 +Hydrate will also be available in traditional U.S. retail channels. V8 +Hydrate looks to go beyond the traditional sports-drink market, which is itself morphing (witness Coca-Cola’s new minority investment in BodyArmour), to take on flavored waters. The new beverage line is designed to tap into several key trends, starting with rapid consumer adoption of plant-based foods and beverages — which, as of 2017, accounted for 19.5% of total U.S. food and beverage dollars, according to Nielsen. In addition, more than 80% of consumers are actively seeking functional beverages with multiple benefits, and they’re starting to “turn away” from flavored waters due to flavor or price, according to Campbell. V8 +Hydrate is designed to be a “better-value, superior-tasting beverage” for health-conscious consumers, to be consumed as a pick-me-up during the day as well as for pre- and post-exercise hydration, says Campbell. Its long list of claims certainly seems to tick all of the currently hot benefits boxes. The drink is isotonic, containing natural electrolytes from sweet potato juice, which Campbell identified as an “ideal” hydration ingredient offering the right texture, sweetness and balance of electrolytes and glucose. The vegetable juice is blended with natural fruit flavors — the drink comes in Strawberry Cucumber, Coconut Watermelon and Orange Grapefruit varieties — to yield a “crisp, delicious taste,” in Campbell’s description. The company is boasting that its consumer research shows V8 +Hydrate being “overwhelmingly preferred” on taste in comparison with the leading plant water, Vita Coco Pure Coconut Water. V8 +Hydrate offers one serving of vegetables, is vegan-friendly, non-GMO and gluten-free, has no artificial sweeteners or added sugar, and delivers a modest 45 calories per 8-ounce can. 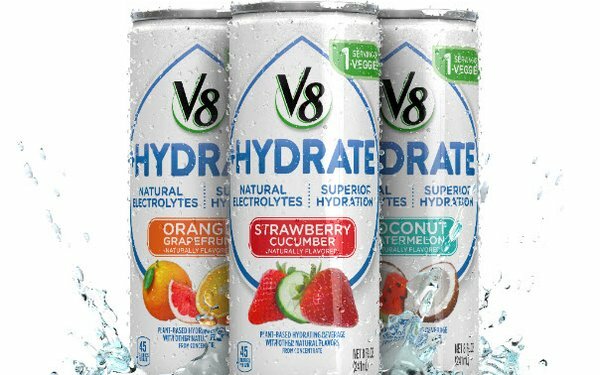 Campbell’s decision to offer V8 +Hydrate only via e-commerce for the first few months reflects the company’s push to scale up its digital marketing capabilities, which began in June 2017 with the creation of a digital acceleration group. That group’s initiatives have included the formation this May of a partnership with tech company Chicory to harness artificial intelligence for digital grocery experiences, and the introduction of “shoppable recipes” on the Campbell’s Kitchen recipe platform. Taking an e-commerce-first approach for V8 +Hydrate “was an obvious move, as the consumer segment we’re targeting is making their purchase decisions outside of the traditional channels,” he adds. “The online platforms allow us to leverage content that is part of our brand story and ethos in a way we cannot engage with shoppers in the aisle." Campbell and the V8 brand are “also looking forward to gathering some consumer data from this initial launch that will give us greater insight into consumer behaviors and feelings about our product that we may not be able to capture through the traditional retail model,” Palmieri says. The initial e-commerce offer for V8 +Hydrate will be supported by sampling events, digital advertising, social and earned media. Campbell isn’t yet revealing its marketing plan for the fall bricks-and-mortar retail launch. V8 Original sales are up 2% in the latest quarter, driven by single-serve multipacks, according to Campbell. V8 +Energy, launched in 2012, saw 50% incremental sales growth in traditional mass/grocery outlets for its 12-count pack in the 12 months starting in March 2017. Further, this line has become “the star of Campbell’s Amazon page” — ranked at #3— with 50% of sales purchased in bulk through Amazon’s “subscribe and save” offer, Palmieri reports. On the broader, corporate front, in May, at the same time that longtime CEO Denise Morrison stepped down, Campbell announced that, in response to “unacceptable” earnings and increased debt load ($9.6 billion) as a result of its March acquisition of Snyder’s Lance, it was launching a review of all of its strategic and operational options, including possible sale of some businesses or brands. The company has now tapped Goldman Sachs, as well as other advisors, to explore the options — and according to some sources, the sale of its fresh-foods business, which includes Bolthouse Farms (as well as the sale of Australian brand Arnotts Biscuits) is one possibility being considered, The Wall Street Journal reported last week. Campbell did not comment on the specifics of that report, instead reiterating its earlier statement about its comprehensive business review. Its decisions are set to be announced on Aug. 30, when it reports fiscal Q4 results. Campbell, like other big food companies, has been struggling to develop profitable new businesses and products in response to declining sales of core packaged-goods products — and is under pressure from activist investors as a result. Campbell’s soup sales declined 1.9% during the past year, according to the Journal. 1 comment about "V8 +Hydrate Is Campbell's First All-Online Launch". Conner Pope from Popesites, August 21, 2018 at 7:15 p.m.
What an exciting time for Campbell! They will soon see the benefits of eCommerce.